These contemporary trousers by Marina Rinaldi are one of this season's must-have statement pieces. With navy and white horizontal stripes on the front and a plain white rear they're an unusual way to incorporate stripes into your look and the navy side stripe is designed to elongate your legs. 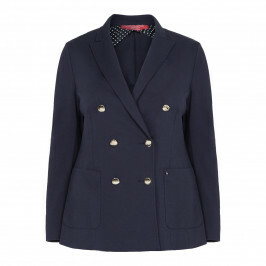 Team with the navy blazer by Marina Rinaldi and a crisp white t-shirt for a bang-up-to-date twist on the nautical look. Patterned jersey-knit trousers with plain colour on the back and contrasting stripes down the sides, belt loops on the waistband and patch pockets on the sides. Closure with concealed zip and button. Back: 69% viscose, 25% polyamide / nylon, 6% elastane; Front: 64% viscose, 31% polyamide / nylon, 5% elastane. Hand wash cold. Do not bleach. Cool iron max 110 °C.